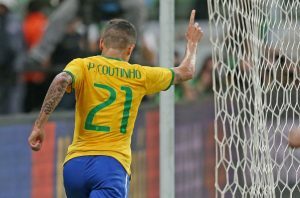 RIO DE JANEIRO, BRAZIL – The Brazilian national football (soccer) team won their first of two friendly games in preparation of the Copa America competition, which will take place in Chile from June 12th onward. The Seleção that fielded mainly a reserve team beat Mexico with 2-0 in the game at the Allianz Parque in São Paulo. Philippe Coutinho scored the first goal against Mexico, photo by Rafael Ribeiro/CBF. It was the first game for the Brazil side in front of a home audience after the 7-1 out against Germany at the World Cup and the team showed a respectable performance, dominating the game most of the time. Seleção coach Dunga decided to give younger players a chance and fielded what can be regarded as B-side of the Brazilian national team. From the eleven players expected to start the Copa America matches, only goalkeeper Jefferson, center backs Miranda and David Luiz, who also captained the team in the absence of Neymar, and midfielder Willian started against Mexico. With the absence of Marcelo and the injury of Danilo during the game against Mexico, Filipe Luís seems to have secured his place in the starting eleven, while Philippe Coutinho made a convincing bid to be considered to replace Oscar. The team played with a 4-2-3-1 formation, a favorite of Dunga during his first stint as coach of the Brazilian national side. The midfield was made up of Fernandinho and Elias as defensive midfielders, Willian and Fred on the sides and Philippe Coutinho in the Center. Fred from Shakthar Donetsk replaced Luiz Gustavo in the squad and made his first start for the Seleção. The 34,659 spectators saw an animated first half with a goal from an almost impossible angle from Philippe Coutinho after 27 minutes and a second strike by Diego Tardelli in the 36th minute after great passing between Elias and Willian. The second half continued with energy, although the Mexicans showed more resistance. As usual in friendly games, the second part of the game was less fluid with many changes for both sides and so the scoreboard remained at 2-0. Brazil will play a second friendly game against Honduras on Wednesday, June 10th in Porto Alegre before they make their debut at the Copa America on Sunday, June 14th against Peru.